I've finished knitting the Clapotis. I just love it. It was a nice simple project with just enough interest to not cause me to go brain dead. 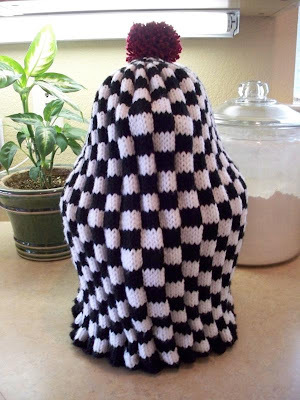 I can see now why this has been such a popular pattern. I especially enjoyed using this fabulous yarn. 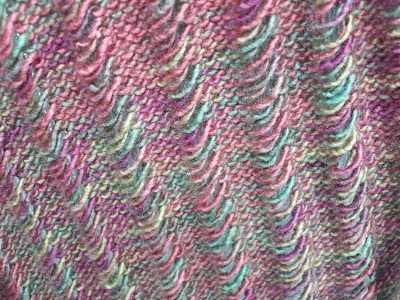 It is maybe the nicest yarn that I have ever worked with. It is insanely soft and the color saturation is outstanding. Some Clapotis beauty shots for you.. Right side of the fabric. Wrong side of the fabric. I love the dropped stitches! It adds so much drape and texture. 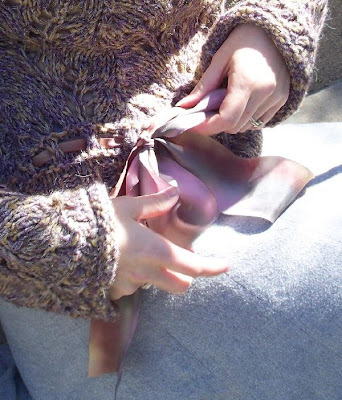 It produces an airy lighter fabric that makes it that perfect wrap for spring and fall when it is a bit chilly out but not freezing. At least in the area that I live anyways. 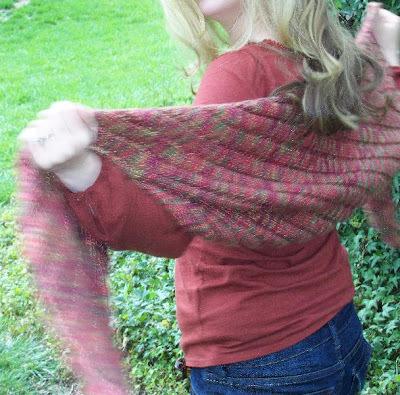 Or it can be a shawl-like wrap around your shoulders. It even looks great with the wrong-side showing! I ended up using 3.5 skeins of Lorna's Laces Lion and Lamb and size 9 needles for this project. As I had previously mentioned, this yarn is decadent. 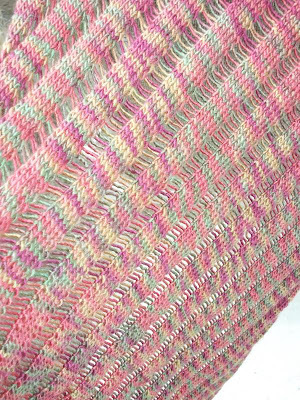 I have however seen the Clapotis made up in other beautiful not quite as err.. expensive yarns. 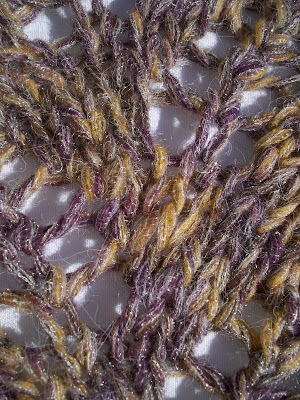 Noro Silk Garden looks great in the project. 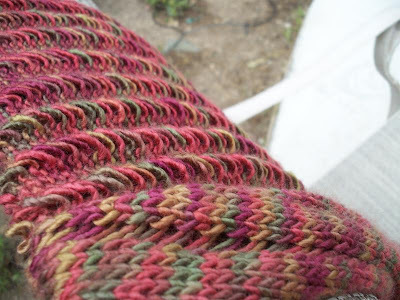 Really any yarn that self-stripes or is variegated is really shown off by this pattern. But as for me... I am planning on enjoying my super decadent Clapotis. 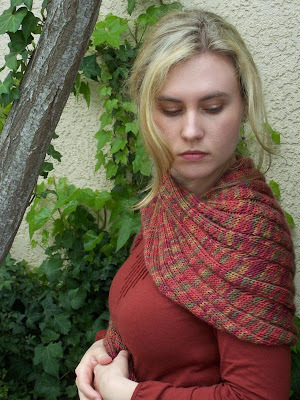 If you would like your very own Clapotis to wrap yourself in, come sign up for the Clapotis Class. It is a one time two hour class. 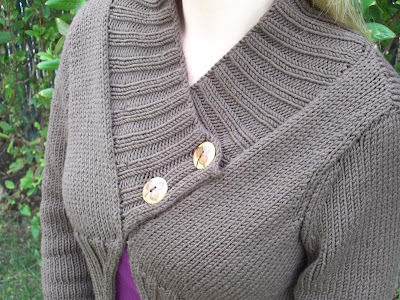 I will help you pick out your yarn, do a gauge swatch, and learn the stitch pattern. 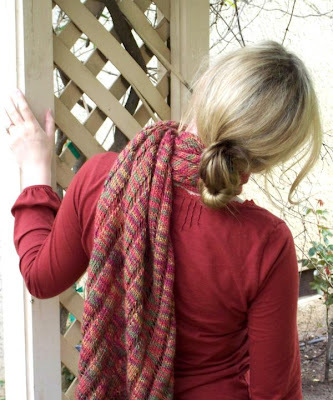 It's a pretty simple project, perfect for a new knitter. I will be offering this class again over the next couple of months so be sure to check The Scarlet Skein's website for future dates and times. If you have any questions about the class or to sign up, please give me a call at the shop. 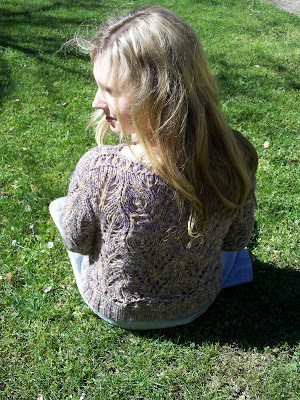 The Terese sweater is done! I am really happy with how it turned out! It turned out so feminine and elegant. Just what I was hoping for, and the silk ribbon added the perfect touch. 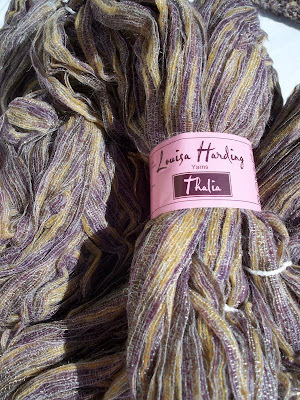 I used 7 skeins of Thalia with some leftovers. I made two modifications. I made the tunic style sleeve pattern instead, and I worked the sleeve pattern one inch shorter before starting the sleeve cap. I must have short arms because the sleeves are still plenty long. As I had mentioned before I had a little trouble knitting the front the first time around. I don't want anyone else to be frustrated so I am including the instructions for what I did. I followed what the pattern note said and worked half pattern repeats when I decreased. Work pattern as directed until it says shape armholes. Row 1: cast off 2 sts. Work 5 sts in St st. Work next 8 sts as the last 8 sts of pattern chart. You should now be at your first stitch marker. 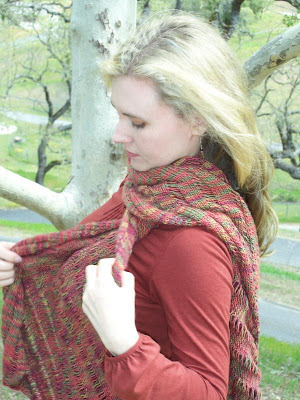 Work the rest of the repeats in lace pattern as normal. Row 2: cast off 4 sts purlwise. Purl to the last st. Knit the last st.
On following right side rows: k2, work last 8 sts of chart. Work middle sections as normal. On last section work first 8 sts in chart, k2. Continue until armhole measures 6.5 inches and proceed with next instructions from the pattern. Work sleeves as written until the pattern says shape sleevehead. Sleevehead??? Row 1: cast off 4 sts, k4, work last 8 sts of lace pattern chart. Work other sections as normal. Row 3: k1, ssk, k2 work last 8 sts of chart. Work middle section as normal. On the last section work first 8 sts of chart, k2, k2tog, k1. Row 4: k1, p2tog, p to last 3 sts, p2tog through the back loops, k1. Row 5: k1, ssk, work last 8 sts of chart. Work middle section as normal. On the last section work first 8 sts of chart, k2tog, k1. Repeat the last 2 rows until 24 sts remain ending on a right side row. Finish sleeve as specified in pattern. 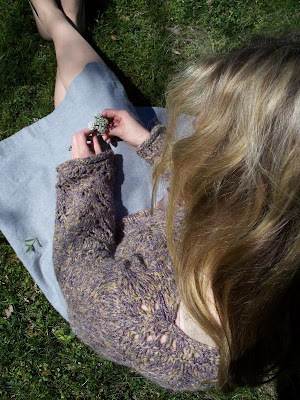 Klaralund was born as a beautiful new project to Alana who cast on excitedly in May of 2007. 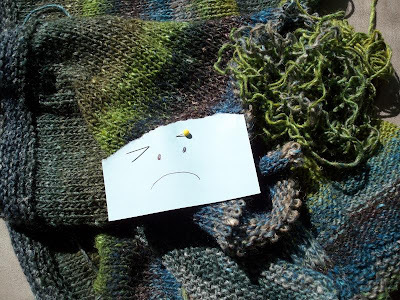 She was devotedly knit on for weeks until she became ill with "boring-to-work-on-itis." She then shrunk in size and ended up being too small for the knitter. (Klaralund claimed that it was the knitter who got a bit bigger...) Since then she has been living in a zip up pillowcase package desperately holding onto the needles that sustain her. 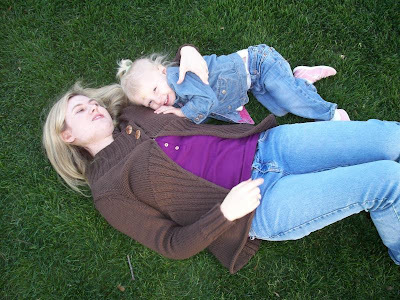 She unfortunately lost her battle on March 16, 2008. With so many sweater projects that I want to start, I had to let go of the half finished sweaters that I knew weren't going to turn out right. 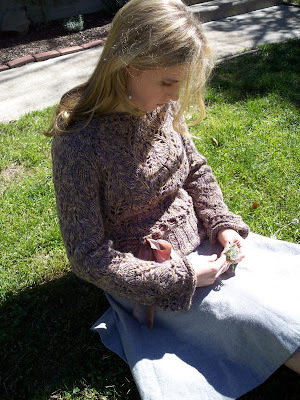 Klaralund is a beautiful sweater pattern but I unfortunately picked the wrong size in the beginning. In denial I kept on knitting hoping I'd lose a few pounds and reassuring myself that I could "just block it out." The fact of the matter is that it would have truly looked terrible on me. 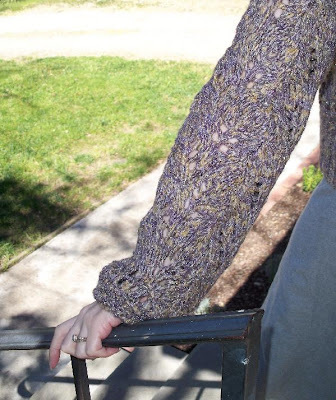 And I didn't want to waste 8 skeins of Noro Silk Garden on an unflattering sweater. I HATE ripping things out but I knew it was the right decision. I frogged the whole thing.... the front, back, and half of a sleeve. 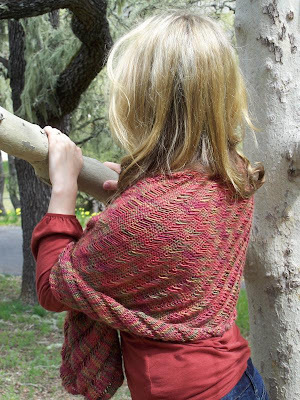 It was a little painful but I just kept thinking of the Sunrise Circle Jacket that I want to knit up from all of this Noro. In other news I killed the Seedling Sweater too. The fabric was wierd because I had to use such a large needle size to get gauge and I wasn't even sure if I was going to have enough yarn to complete it. But I don't just murder sweaters, I finish them too. The Terese sweater is done!! It looks great. I hope to take some proper pictures of it tomorrow. I've got myself a new project! 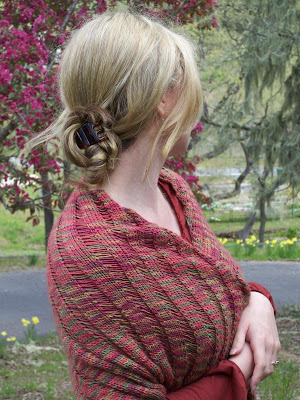 The Scarlet Skein has recently started carrying Louisa Harding's new collection for Spring, and I am in love. (Sorry Husband) So of course I didn't mind when I was asked to knit a sample for the shop. Louisa's new book Dauphine is amazing and full of feminine Marie Antionette-like designs. One of the interesting thing about this new book is that all of the designs are knit from ribbon yarns. 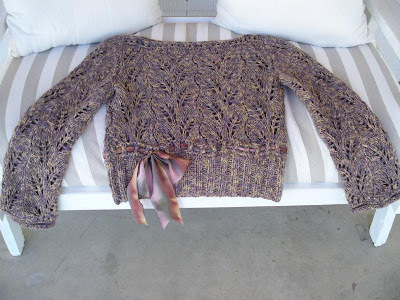 The sweater I chose "Terese" is knit with a ribbon too. 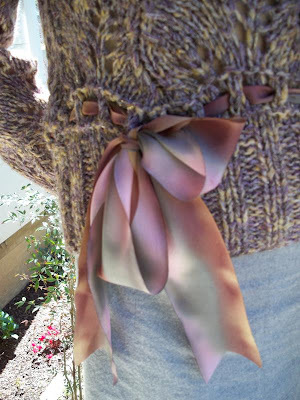 I have never knit a sweater out of ribbon before so it is really fun for me! The yarn that I am using is new as well. It is called Thalia. It is a lightweight gauzy ribbon. 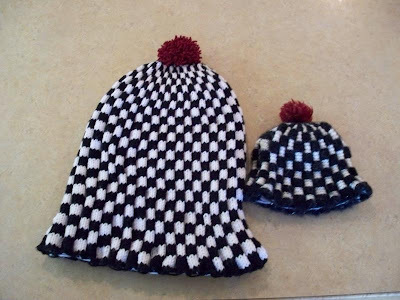 It is surprisingly soft because it contains 12% mohair and 6% wool. Mohair is usually my arch enemy but isn't bothering me with this project. Maybe it's because there is so little of it. I have really never knit with anything like this before. If you live locally you should come by the shop and see it for yourself. It is really unique. It is knitting up surprisingly fast (I am using size 11 needles!) 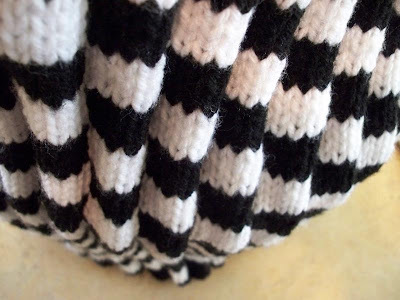 and I think that the stitch pattern is gorgeous. I've already knit up the front and am working on the back. 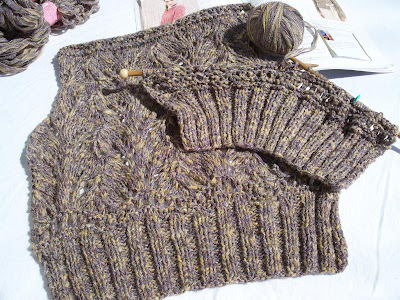 I should be able to get this sweater off of the needles in a week or so. The project has been a bit frustrating to me but it's really not entirely Louisa's fault. To be perfectly honest with you this is the 3rd time I have knit the front! Ok... so you know how this is knit in this beautiful lace pattern? Do not work any incomplete patt reps, work half patt reps or take extra sts into st st.
Well I guess reading any Pattern Notes before starting your project is a good idea. I ripped it back. As I was ripping I saw a mistake in the lace pattern on the second row. I thought... well as long as I'm ripping I'd better fix that one too. Ok... back on the needles I am knitting away.... this time I decide to work the side lace panels in stockinette while I am decreasing. I tell myself, "Forget the lace pattern on the sides!" That was not a good idea. I had tried to take the "least brain activity" way out of this but the finished result was really bugging me. When I was done ripping it out for the second time I started ripping out my hair as well. At this point I also threatened what was left of Terese with a pair of scissors. I was feeling a bit disappointed in Louisa. Why couldn't she just TELL me what to do instead of these vague "pattern notes"? Thankfully, the third time worked out. 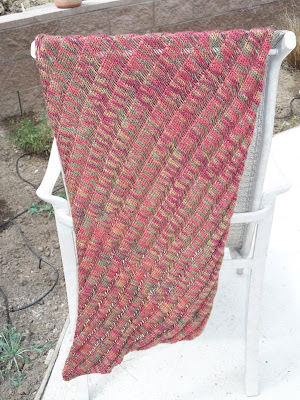 I worked half pattern repeats from the decreases on. It took a bit of figuring, but I will be kind and share the method in a future post for anyone who wants to knit this sweater. Outside of that problem everything has gone fine. I like the yarn. I like the pattern, and yes I like Louisa Harding again. You can see how fast this sweater knits up for me to practically knit the whole front 3 times in one week. If I would have figured this out sooner I could have been almost done with it by now. I also have my eye on this design as well. It is just so pretty to me. I think one of the reasons I like these designs is because they are dressy and I just have never knit a dressy sweater before. Besides Terese, I am also knitting away on my Clapotis. I want to get both done by the end of this month. Which I should be able to do if I don't have to rip out anything else. Is your stand mixer feeling like a “plain Jane’’ sitting there on your countertop? 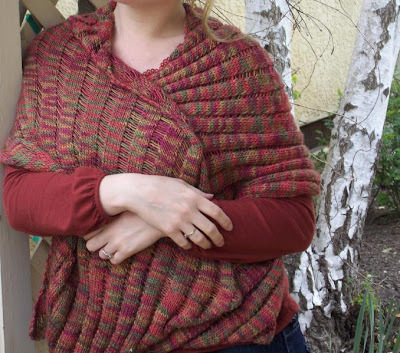 Dress it up and keep the dust off with a fun Mary Engelbreit inspired cozy. One Size. Designed to fit over a standard size Kitchen Aid Stand Mixer. [CC2] Red Heart Super Saver 100%Acrylic; 364 yd/333m per 198g skein]; color: Burgundy; #1 skein (You just need a small amount for the optional Pom-pom on top. 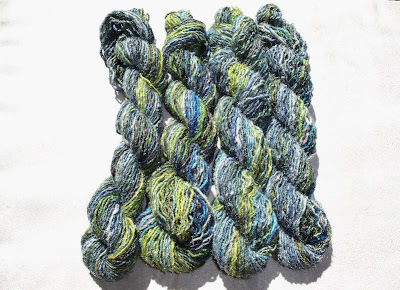 *If you do not want to use an acrylic yarn, a worsted weight superwash wool would be a great option. Kitchener’s Stitch- Thread a tapestry needle. With RS facing and holding one DPN at the front and one at the back, insert tapestry needle into first st on front needle PURLWISE. Then insert tapestry needle into first st on back needle KNITWISE. *Next, insert tapestry needle KNITWISE into first st on front needle, pull it off of the needle, and insert yarn needle into second st on front needle PURLWISE. Next, insert yarn needle PURLWISE into first st on back needle, pull the st off of the needle, and insert tapestry needle into the second st on back needle KNITWISE. Repeat from * until all sts are worked. 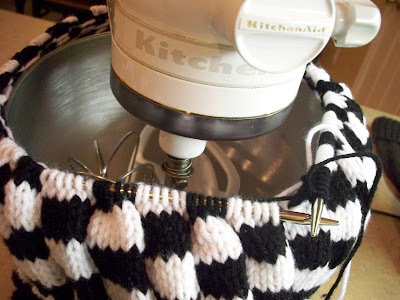 It is a good idea to try on your stand mixer cover as you go, this will help you to figure out if you are staying on gauge and not pulling your yarn too tight. 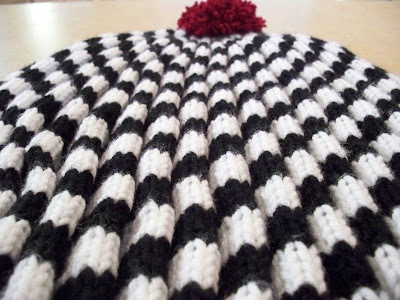 With [MC] black cast on 222 stitches onto size US #9, 32 inch circular needle. Place a marker and join into the round being careful not to twist your stitches. Round 5: With [CC] k 6 sts, switch to [MC] k 6 sts. Repeat Rounds 1-8 17 times more and then Rounds 1-4 once more. Start decreasing rounds and switch to smaller circular lengths when the stitches get uncomfortably tight around the needle. Divide remaining 38 stitches evenly between 2 double pointed needles. Kitchener stitch the remaining stitches together. Weave in ends. 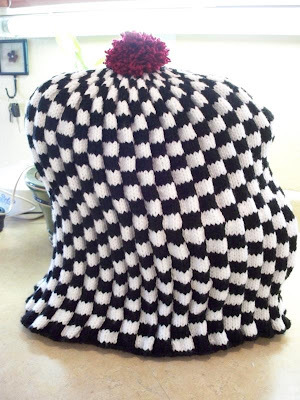 Make and sew on a pompom using [CC2] if desired. Put your new cover on your stand mixer and admire your hard work! I know that I've already posted pictures of the Tilted Duster being worn at Stitches West but I didn't get a chance to post the information that I wanted to about it. First of all, I am really mostly happy with how it turned out for me. I used 13 skeins of Filatura Di Crosa Zara Plus which is a machine washable and dryable 100% merino wool. I had already washed the sweater before wearing it and it held up perfectly in the washer and dryer!! I am so excited to have an easy care hand knit sweater! I hate washing sweaters in the bathtub! I am also so happy that this entire sweater cost me only approx $26 because I used some sale yarn that I got 75% off! Pretty awesome huh? I also like how fast it was to knit up. If you have followed the blog you'll know that I started it months ago, knit the fronts and the back and then set it down. I didn't get back to it for a long while due to other knitting obligations. When I picked it back up it only took me 9 days to knit the sleeves, the collar, the skirt and seam it up! This is definitely a sweater that anyone could knit in a month's time. The Tilted Duster is also versatile. The collar can be worn buttoned up or folded back like a shawl collar. So now for the dislikes... I tried it on before picking up stitches for the skirt and the top part was too big. And as you can tell in the picture it does pucker up some. The weight of the skirt did help it lay better but I still wish that I had knit the 32" size instead of the 36" Since I measure 34" I thought that it would be safer to go up a size. Well in this case I think it would look neater if it was a little more form fitting at the top. To compensate for the big top I knit the smaller size in the skirt. I was just so afraid that I was going to look like a brown saggy blob in an oversized sweater. I don't know if this was the best idea but it turned out fine in the end. I also knit my sweater one repeat shorter than the pattern called for. Why you may ask? Did I think that it would flatter me more? No... I ran out of time the night before I went to Stitches. I really wanted to wear it and ahh.. well... it was 2:00 in the morning. I did really find some helpful hints for the duster from the Ready Set Knit podcast. 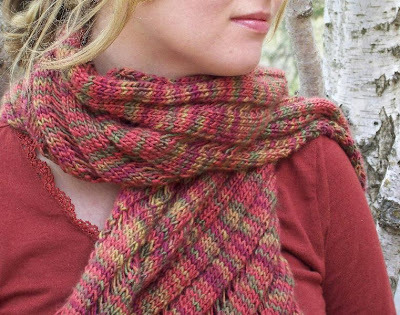 They did a Tilted Duster knit-a-long and posted some good tips here. All in all, it was a good project. My sweater is really comfy... too bad it is getting hot outside. Thank you, thank you, thank you for all of the great suggestions for my Sea Silk dilemma. I really enjoyed all of the different patterns that were submitted. I was disappointed because a lot of the patterns that I liked required more yardage than I have available, so I wasn't able to pick them. After careful thought I decided to go with Knot Knitting's suggestion and make the Melon Shawl from the book Victorian Lace Today. To everyone else that participated, thank you again and I really appreciate all of your great ideas.